Tanzania art is a category of art that features the country of Tanzania, which is in East Africa. These savannah images provide art audiences with a glimpse into the lives and environments that are familiar for East Africans. 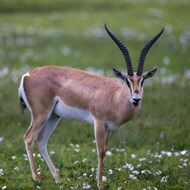 Additionally, Tanzania art also features some of the most infamous animals that are associated with the African plains. Many works of Tanzania art is natural photography. These sensitive savannah images often feature the interactions between creatures that live in Tanzania. One example of these exotic animal prints can be seen in the natural photograph, 'Herd of Wildebeests Walking in a Row Along a River, Ngorongoro Crater, Ngorongoro Conservation Area, Tanzania' by Panoramic Images. Landscape pictures are also commonly found in Tanzania art. These works document the moods of the savannah and are highly popular among art audiences. Works like 'Tree with Western Storm Clouds Tanzania' by Panoramic Images is particularly vibrant. For Tanzania art viewers, these works serve as a visual aid for understanding and picturing what life is like on the savannah, regardless of whether these savannah images portray humans or animals. Tanzania art is a great addition to a home or business's interior design scheme. The informational status of these works makes them a sensible choice, however these exotic animal prints and landscape pictures are capable of making a profound emotive effect on the viewer. In the home, these works are typically displayed in more public areas, such as the living room, den, and study. In the business, however, these savannah images are proper nearly anywhere, including waiting rooms and offices.